Rally Bike is one of those games that I have wanted for a while, but not bad enough to search out unrelenting till I found one. It's a top down, vertical scrolling motorcycle racer made by Toaplan with the happiest music in any Toaplan title that I can think of. It's not gritty, its not militaristic and its fun as hell. 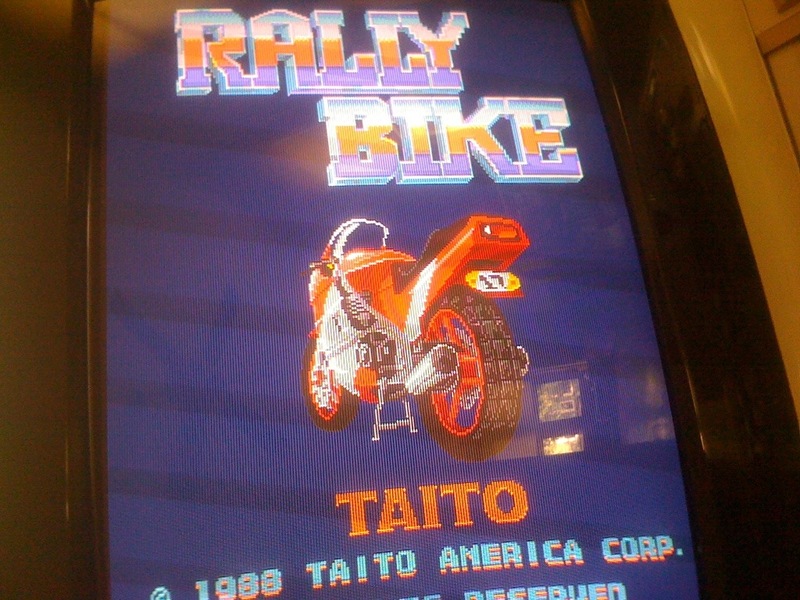 The game has a lot of hidden bit and pieces to it, like in stage 1, where you can jump your motorcycle at the end section of the stage into the back of a farmer's pickup filled with a few pigs and then you can control the truck through the end of the stage, running over other motorcyclists and plowing through to the finish line. It's a great non-shmup Toaplan title. I picked it up this past weekend at caldwert's meet from the man himself at the same time I got Same! from gunbird18. Such a great game - cant recommend it enough. More people need to know about this gem. Totally right. Great diversion from shmups and a really fun game that gets very hard on the last few levels.